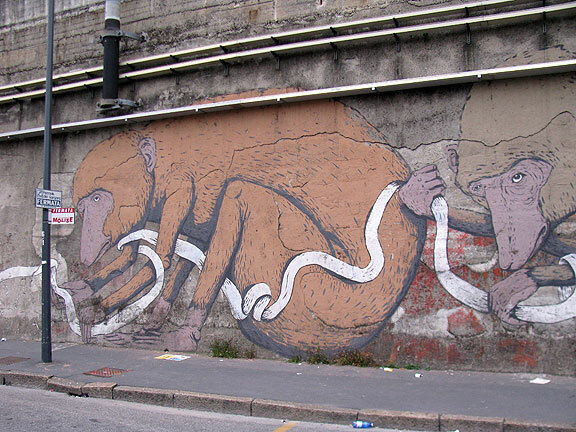 The title was given me a few nights ago at the Carroponte Festival by Anita Bacigalupo, who explained it as a metaphor for going to the roots, back to the beginning, stripping away the edifice and assumptions that usually cloud political arguments. We burst into laughter when Chiara Martucci pointed out that it was not really an expression in Italian either! Anita was one of my intrepid companions for the last four days. She joined me for all my four events, sometimes as translator and sometimes as a friend, along with Chiara, who did such a great job of setting up my mini-tour of Milan, and also was a great companion and friend these past days. We will miss each other already! And of course my great friend Giovanni Murat (who I always stay with in Milan) was also part of the fun, along with his pre-pubescent son Rocco (the next time I see Rocco I’m sure he’ll have a new voice and seem much older than he did now at 12). I was laughing as I walked to the train this morning, remembering how Giovanni stood glowering behind me for five minutes before last night’s public talk. I think he was posing as a bodyguard just in case there were some old-style militants who might want to pick a fight with me? Hard to say. It seemed quite comic, as you can see in this photo. 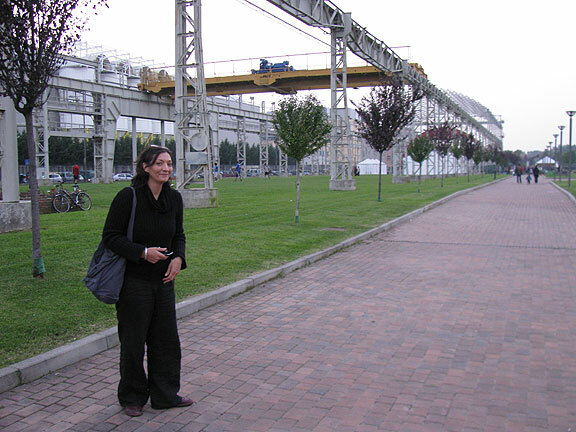 Chiara as we approach the Carroponte site, a former Pirelli rubber and tire factory. 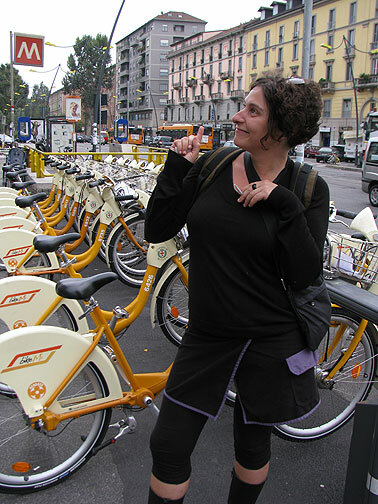 Anita strikes a pose at the bikesharing station. 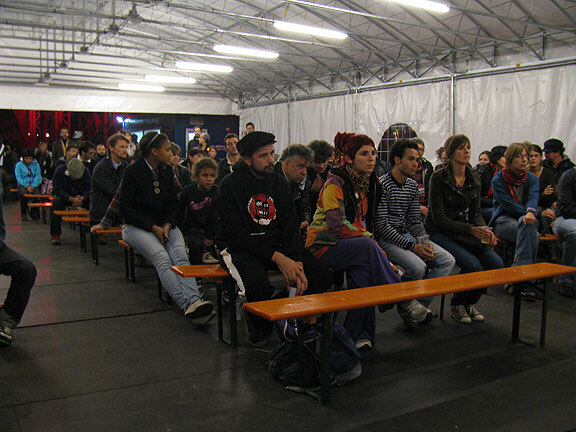 The audience at the Carroponte talk. 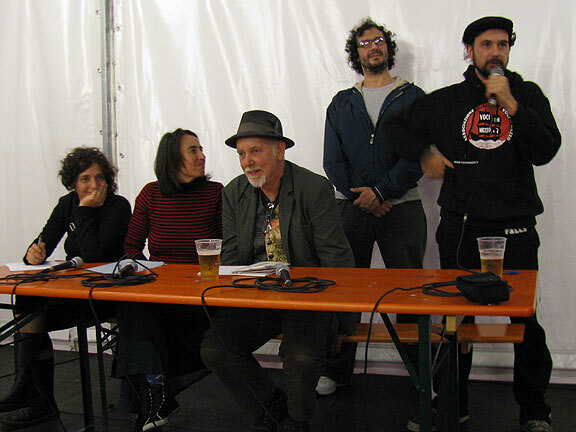 The evening was hosted by Scighera, a cooperative organization who as anarchists have somehow insinuated themselves into the national ARCI organization, which is rooted in the old Communist Party. Go figure”¦ They are experimenting with a different system of compensation among themselves, paying according to need, though no one was paid more than a middling salary, and as an association, they were all precarious and without contracts or guarantees. 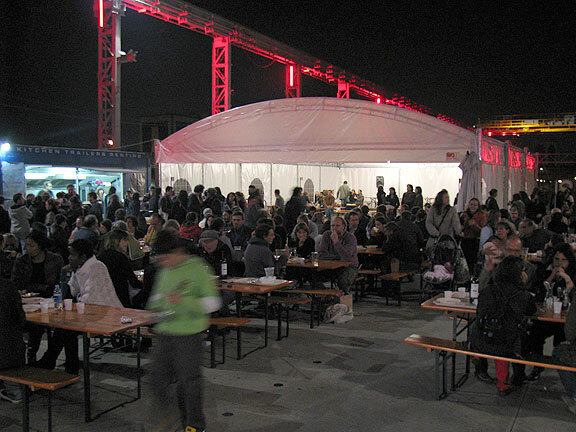 The event was held at Carroponte in Sesto San Giovanni, a separate municipality on the northern edge of Milan. 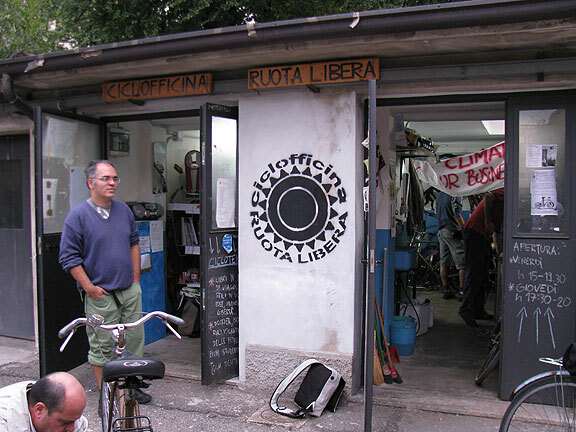 The space itself was originally a Pirelli tire factory (Pirelli, another name with roots in the violent rubber trade of the 19th century and the early bicycling boom). It’s now a public space and all summer they have this ongoing Festival, mostly music, but with some speakers, booths, food and booze. Later in the night I was treated to some great Noccino, hazelnut liqueur, and a raspberry one too, Lamponi. It’s the season for fancy liqueurs here, maybe being harvest time? The eating area outside the tent where we had our presentation. I was the featured speaker, always an odd sensation even after being billed as something of a star many times on this trip. We did manage to sell some books which made the publishers happy, since they hadn’t moved many up to now. But as usual I’m not really here to sell books, but to be a kind of Johnny Appleseed with the apparently hopeful and inspiring shift in political thinking that Nowtopia carries (at least that’s what I deduce from the many warm and enthusiastic people I meet after most Talks). Last night also had a big stage with a fantastic big band called Nema Problema, doing their own songs as well as a few standards from the vast repertoire of Balkan brass hits. They really rocked the place, and I got some good dancing in, even being invited down close to the stage by a woman who smilingly took my hand and dragged me there. 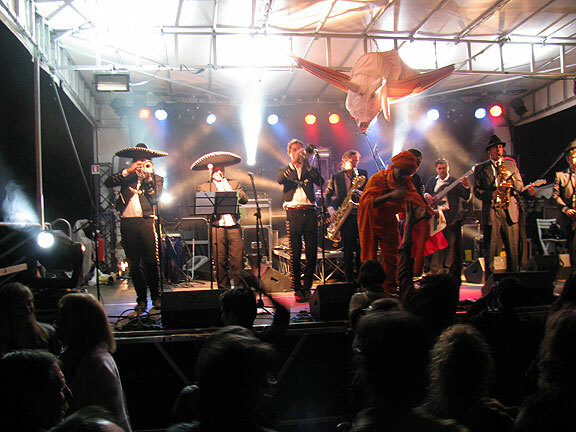 The band had three trumpet players who were incredibly sharp, dressed as Italian “mariachis,” while the other side of the stage had the saxophones and electric guitar and bass and were dressed as the Blues Brothers”¦ and the music was big brassy Balkan dance music. 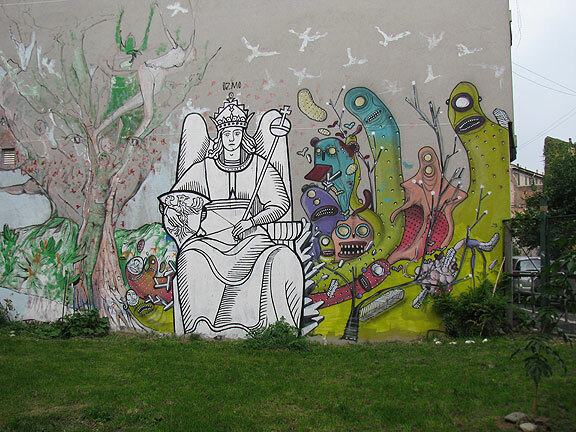 Wildly eclectic, even a touch of post-modern whimsy”¦ Awesome! 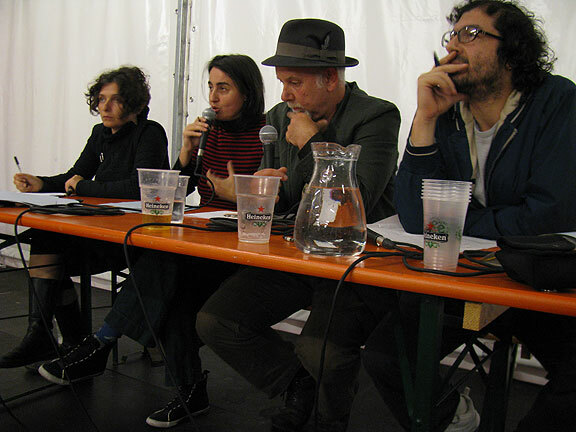 The curious thing about the Carroponte presentation, where about 50 or 60 people were in the audience, and the event two nights earlier at the Italian publisher of Nowtopia, SHAKE Edizioni, is how little discussion or response was forthcoming. Chiara was equally depressed and puzzled by it, as was Giovanni. I admit I didn’t end with a rousing crescendo or exhortation, and that may have been confusing for the audiences”¦ even when there is a semi-clean ending, by the time it’s translated, the emphasis changes and it seems like I ended in mid-thought”¦ oh well. 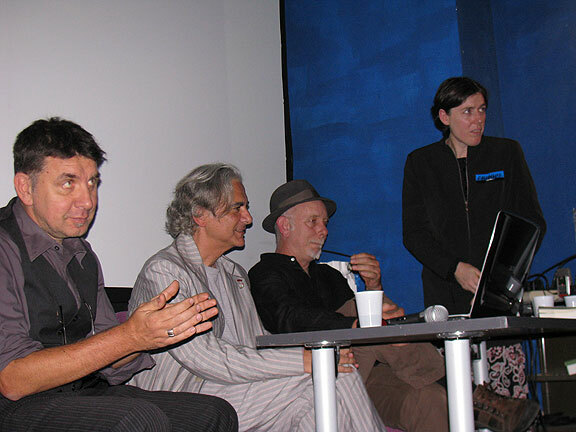 Gomma of Shake, Matteo Guarnacci, me, and Serena at the SHAKE book party. 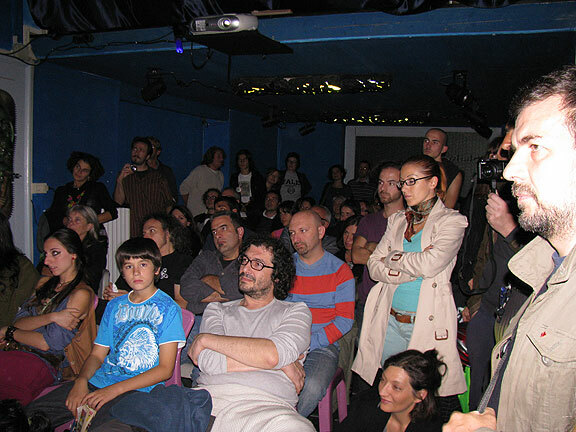 The Shake audience, with Giovanni and his son Rocco in foreground. 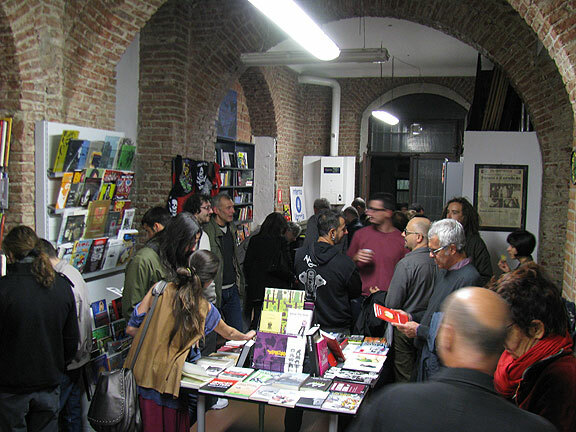 The Shake bookshop, interestingly located in the middle of the biggest drug dealing buildings in Milan! 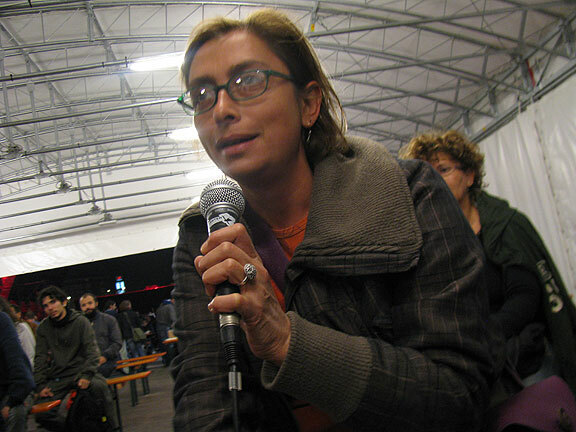 After a long pause at the end at Carroponte we did get some questions, one of which came from a woman who started by explaining how a friend of hers had died on Milan’s streets this past June while riding her bicycle, hit by a car. She wondered what my attitude towards the state was, especially in terms of the kinds of infrastructural changes we often advocate for. Who else would implement these new ideas if not the government? A reasonable question. I tried to explain my long antipathy to organizing towards influencing government and policy, and that I still believe we’ll have much better success if we build our own power and activity to the point that local government (and maybe at higher levels too) begins responding to our initiatives rather than continuing to shape our activities to what might be possible to extract from a basically recalcitrant state. This is the woman asking about my attitude towards the State. The first night at the Utopia bookshop we got some questions, but that was a very small, intimate setting. 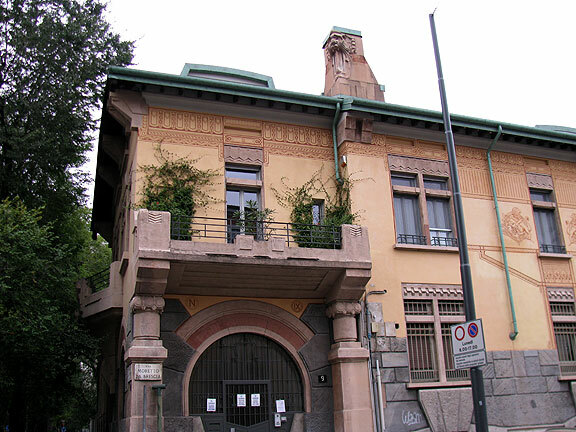 Similarly, at the University of Milan political science class, hosted by Daniela Danna, I had the pleasure of presenting, followed by some good, pointed questions, and then sat back as the class erupted in a spirited debate among themselves that carried on for the last 20 minutes or so. 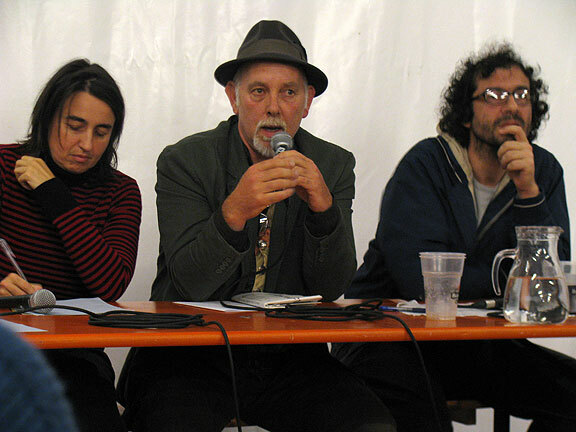 There is also the typical Italian (and maybe typical leftist) phenomenon of preceding a “question” with 5-15 minutes of prologue/speechifying. Far be it from me to criticize this since I’ve been known to do the same on many occasions, but it is striking how common it is here. The guy in the class who raised the first question spoke for a good 8 minutes before he wrapped it up. Somewhere in there, towards the beginning actually, I heard him identify the two main problems as power and conflict, and indeed, these are the best questions to challenge the Nowtopian argument with. Anita at left, then Daniela, who also hosted the class at the University of Milan, me, and Giovanni. Having three translators to take turns worked really well! Similar to criticisms I got in Sweden, and from my own daughter at other times, there’s a real objection to the presentation of something as radically subversive that isn’t somehow directly conflictual andÂ antagonistic. 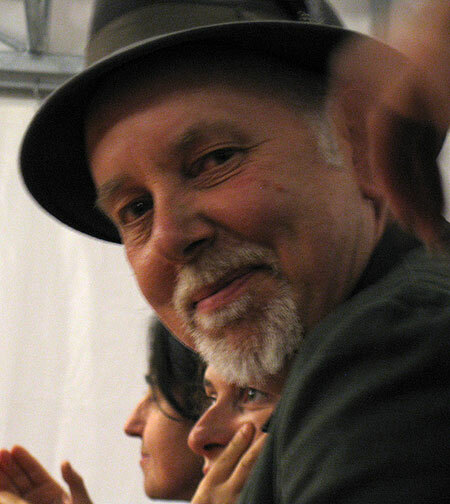 But it leads naturally to my continuing promotion of radical patience, neither passive nor pacifist, but just a way of being that makes it possible to sustain a radical oppositional current through this dark age and into a time when there are more of us, more coherently self-organized, when our power might really be a threat to the way things are. 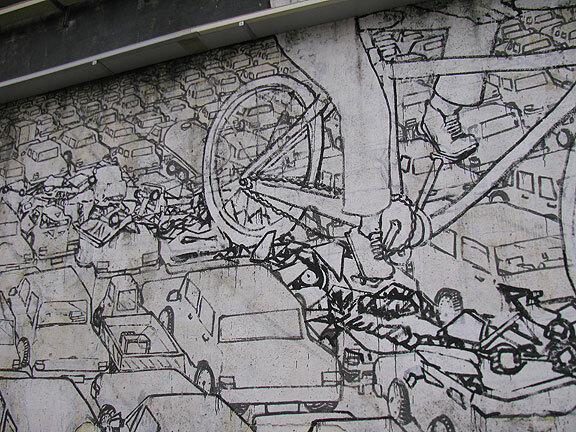 Thinking that somehow if we are just antagonistic enough, active enough, brave enough, etc., and that will trigger a spontaneous uprising among millions of our co-inhabitants of this society, is a quasi-religious fantasy. We will be in the trenches of daily life for years to come” I advocate that we enjoy the process of creating associations and communities that have enough internal trust that we can actually argue about the shape of things to come. From such a foundation we might be able to reimagine revolution, but at this point such a term is floating in search of a reference point. In other words, there’s an awful lot of daily cultural work to do to create the momentum for a political shift of the sort I think most of us are interested in. In other words, we have to start from the sausages! 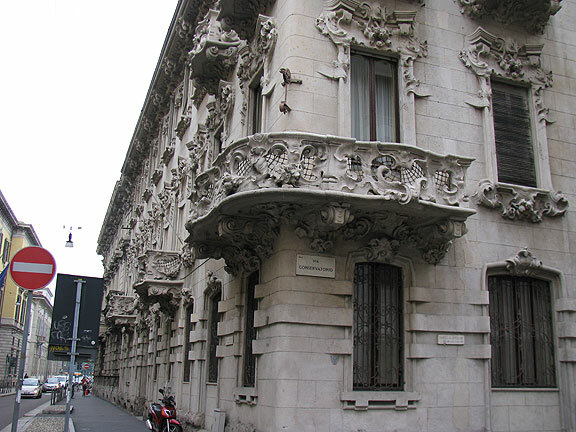 Milan has a lot of gorgeous old buildings. This one, the House of Big Men, is from the 1500s. 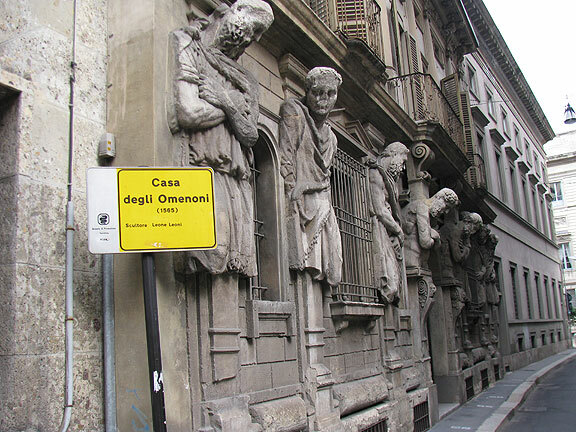 You come upon buildings like this quite often walking around in Milan... check out that chimney! 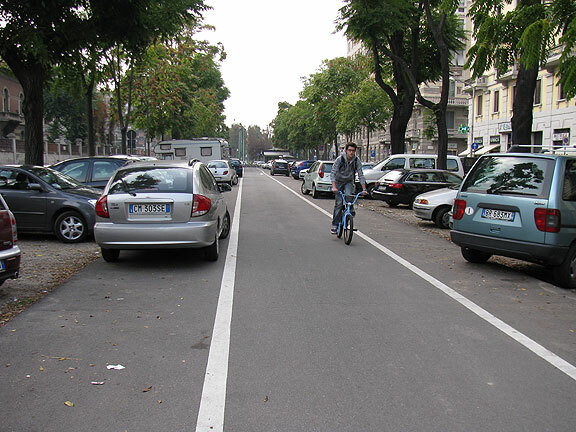 Typical street scene in Milan... you can see why lots of people are intimidated to ride bikes here. 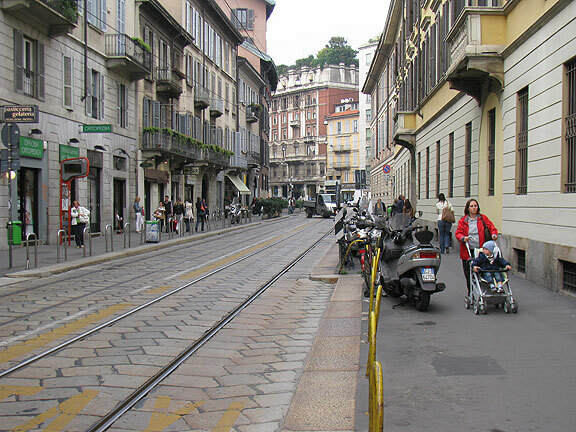 Milan is a city that I like, even though there’s no denying that it is a fairly gray burg, usually overcast, and somehow a bit bleak. The frenzy of commerce is in its pores, along with the haute fashion industry, which are also joined at the Hip. The number of extremely good looking women and men, dressed to the nines, walking around Milan is always surprising and frankly pretty fun for a few days. I don’t mind enjoying the eye candy! 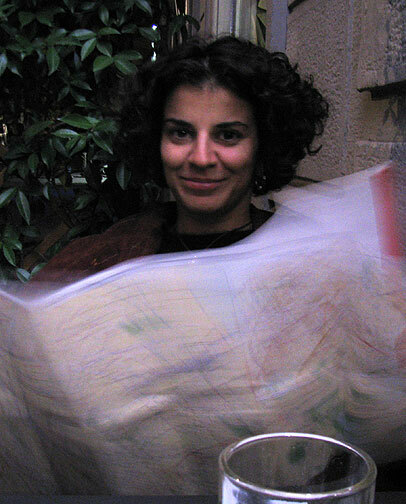 I had the pleasure of reconnecting with Zoe Romano, one of the protagonists of Serpica Naro, a fake fashion brand launched some years ago to generate a counter-tendency from within the clothing world. 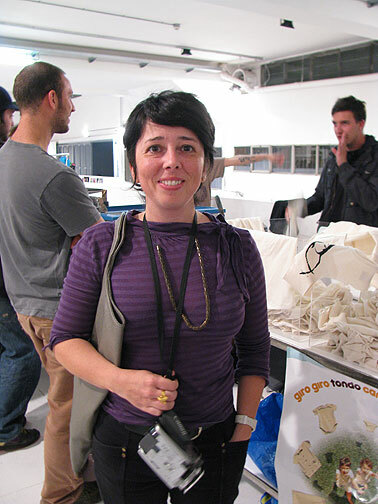 This time I met her at a big 3-day event she helped organize called “So Critical” which I told her should have been called “Sew Critical” since it was mostly DIY clothing makers, using healthy materials, locally manufactured mostly by themselves. The clothes and shoes and bags were innovative and beautiful, and it reminded a lot of the Trunk shows that have been growing in San Francisco over the past few years. In fact I think this constellation of designers and creators is very similar. Zoe sees her role as bringing a political sensibility into the edges of the fashion world, building on the healthy revulsion a lot of new graduates and entrants into that world feel when first confronted with the preponderant weight of capital, of conformity, of the arbiters of taste. 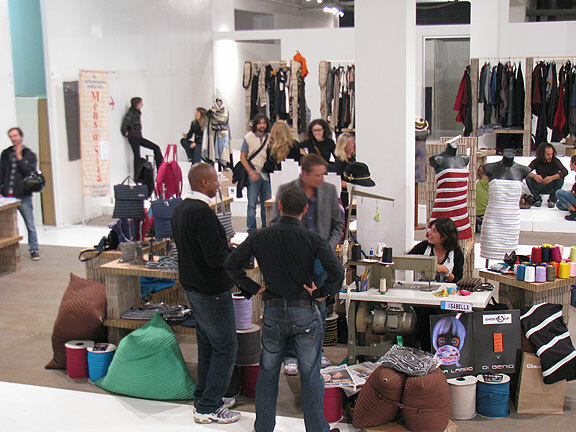 In addition to their enthusiasm for local production and ecological sustainability, they are seeking a collaborative creative model online through a new project called “Edufashion”Â which is has partners in Milan, Ljublana, London, and Copenhagen. Zoe Romano at So Critical. So Critical... or Sew Critical? 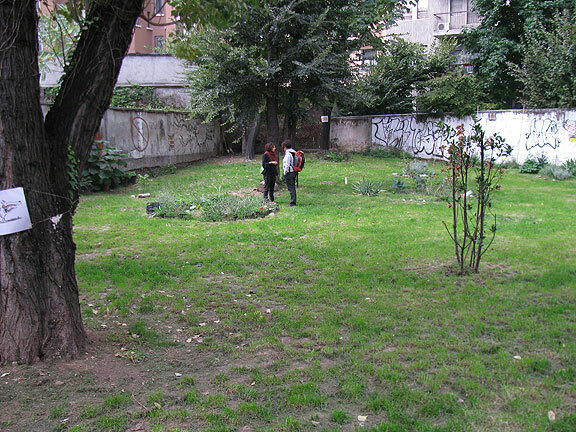 Anita Bacigalupo and Maresa Lippolis in one of Milan's rare garden spots in the inner city. Maresa Lippolis greeted me at one of the early stops in Milan, and I remembered her from two years ago when I first met the Serpica Naro gang. She helped me to borrow a bike from Tibi, whose 14-year-old is the youngest participant in one of the local DIY bikeshops (cicclofficine). 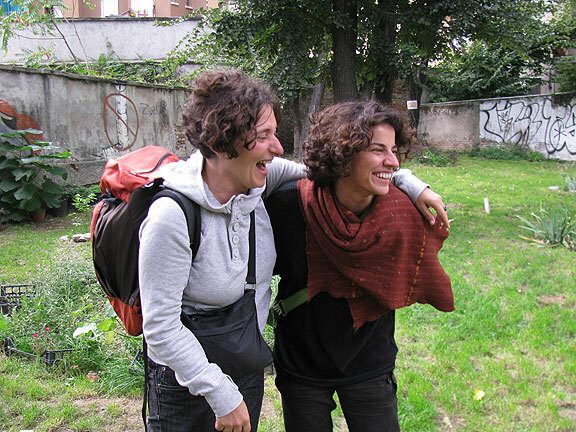 Both Maresa and Tibi are involved in the nascent community gardening scene in Milan that you can check out here. And then I got to ride behind her as we bolted across the City several times” nothing like chasing a bold, safe, and aggressive rider through an unfamiliar city with chaotic traffic! I love it! Same inner-city garden, view in from outer edge. 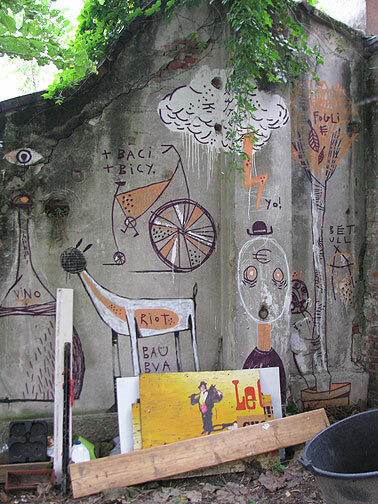 "Cave paintings" at back of community garden. 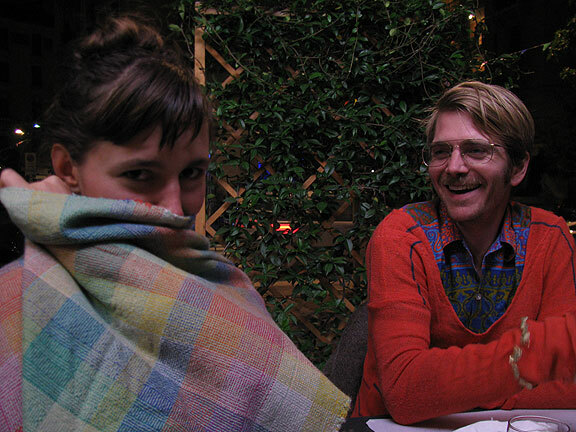 Iris with one of Travis's textiles, and Travis at dinner. 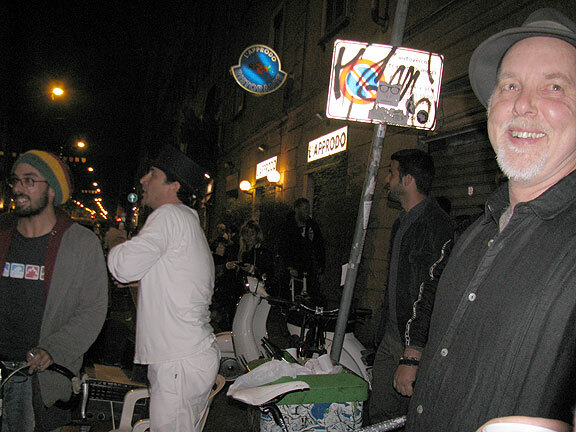 One of the wild highlights of my time in Milan was at the end of the SHAKE presentation (which I shared with Matteo Guarnacci, a Tom Wolfe-esque character in a light gray pinstripe suit with long flowing white hair who has written about the Dutch Provos, psychedelics and the history of rebel style in two volumes for the same publisher), when I was called to come outside to the street. 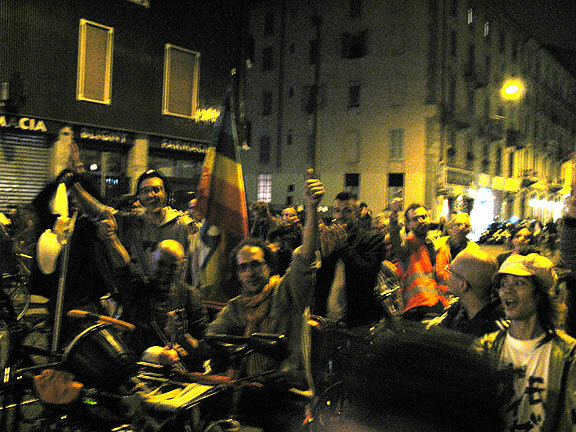 There was the Milan Critical Mass clamoring for me to join them! 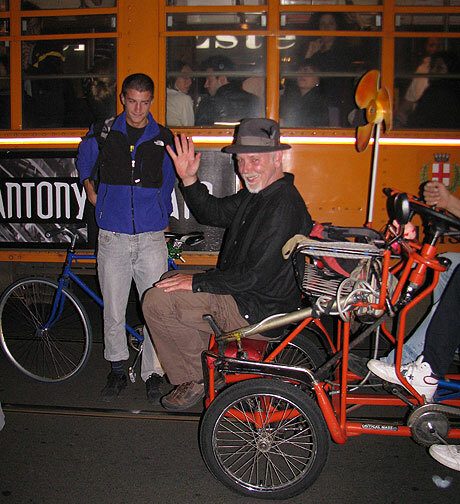 Coming out to greet Milan's Critical Mass, Sept. 30, 2010. 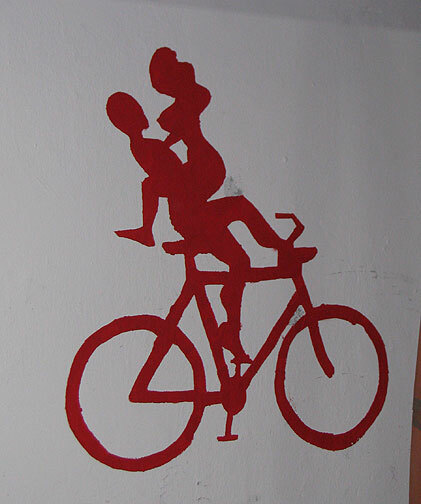 I am led to a quadricycle for a ride. It was one of those moments that is in some way deeply embarrassing but you can only enthusiastically join the moment because that’s what everyone wants. So I waved and cheered them, of course, and suddenly I was being pulled to a quadracycle, and put on the front seat. Off we went on a long circuit of the block, with me in front of the front vehicle, all the cyclists laughing and cheering behind me. It was great fun! I was soon brought back to the starting point and I went back to the book release party. But it was truly magical” one of the Milanese CMers told me they’d brought the mountain to Muhammad, and I could only laugh as I tried helplessly to reduce the attention. Try as I might to correct it here, the Italians still insist on labeling me as the “inventore” or “fundadore” of Critical Mass. I’ve told dozens of people and at least four of my audiences that this is the wrong understanding of history, and that such a phenomenon as Critical Mass could not possibly be invented or founded by one person. One guy in the Milan ride asked me in an endearingly sweet way if I would please tell them about the beginnings of CM, even though he knew I must have told the story a million times. So I told him, yes, we were at least 20-40 people who had been talking about it for about two years before it began. 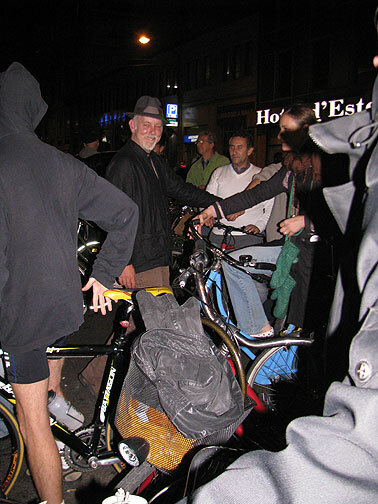 The first ride took off with close to 50 people, but it had taken the efforts of several dozen to make it happen”¦ not to mention that every other city that has a Critical Mass has a parallel experience, where some group of local cyclists has taken it upon themselves to invent it anew for that town. 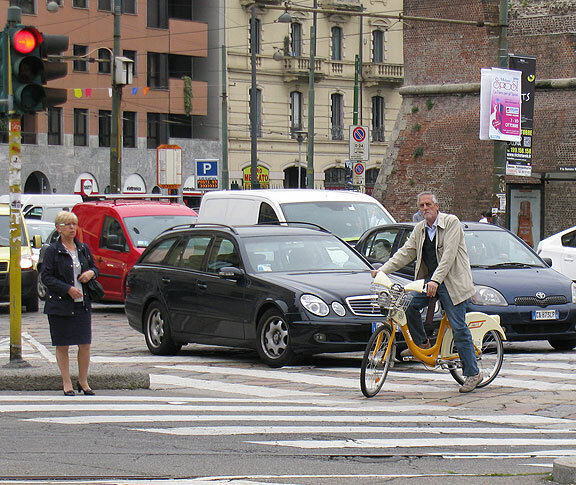 I enjoyed riding and walking around Milan. The architecture often reminds me of Mexico City, with the big 4-6 story palazzos, ornate balconies, baroque decorations, wide tree-shaded boulevards. 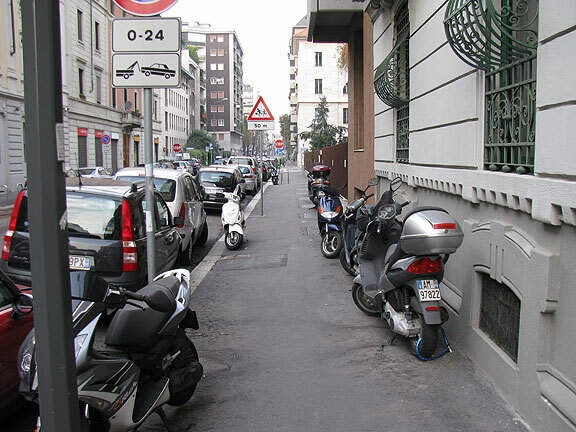 Annoyingly the scooter is omnipresent here, and you often come upon a sidewalk jammed with them. Parking regulations here seem to be a joke, and the few bike paths I saw are useless. This weird bike path extends about two blocks, running down the middle of a wide boulevard. As you can see the center area is jammed with parked cars, and as it happens, I rode a bike along this street and never even realized there was a bike lane in the middle of it... From the next photos you can see it ends pretty uselessly at a big cross street. 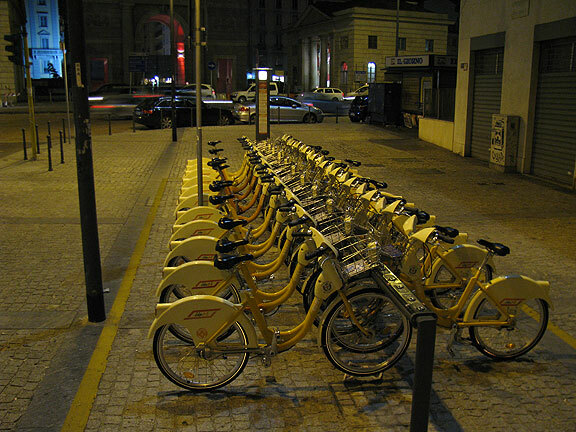 There is a bike-sharing program which Giovanni told me was a complete failure, but actually I did see at least a half dozen of them in use, always by middle-aged people. The system requires pre-registration online or at transit office, so I didn’t both to set up an account for the four days I was there. That alone seemed a dumb arrangement, where an interested tourist like myself is dissuaded from trying it out because of a cumbersome bureaucratic procedure. 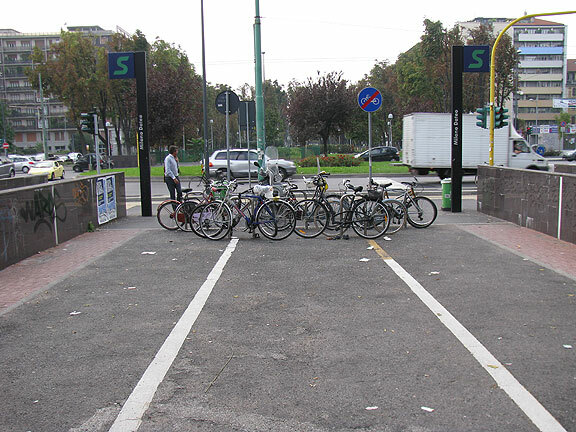 Anyway, bike stations are all over the center of the city, but Milan is a city choked with traffic and aggressive motorists. I don’t mind riding through that, but I don’t think it’s very inviting for folks who are not regular urban cyclists, so the bike-sharing program will probably be pretty underutilized until they begin to alter the streetscape too. Most of the bikesharing stations I saw were pretty full, like this one late at night (when you'd expect them to be mostly not in use). 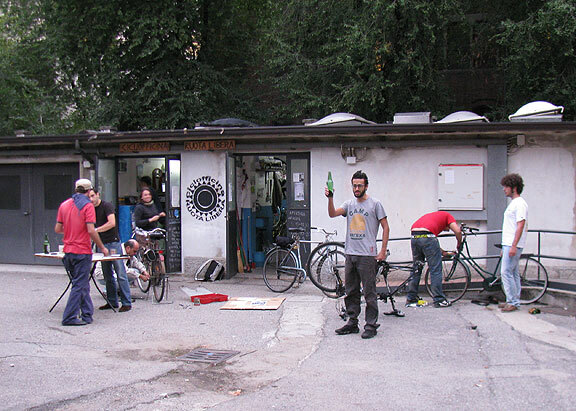 Filippo hoists a beer as I arrive at the Cicclofficine Ruota Libera. It was fast and furious, though I managed to squeeze in some tourism too. We made it to the shopping district and found ourselves facing a massive installation in the Piazza del Duomo. The NBA had come to town to drum up interest in its increasingly international game. Italians seem pretty interested in basketball anyway. I saw a lot of ads even in Siena for local professional games, and as I recall Kobe Bryant grew up in Italy so maybe that helps the interest too”¦ funny to think of him speaking Italian. 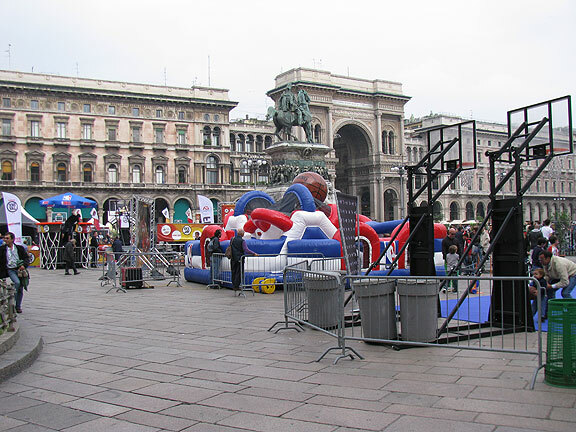 NBA Day in the Piazza del Duomo! Blue mural on the train station. 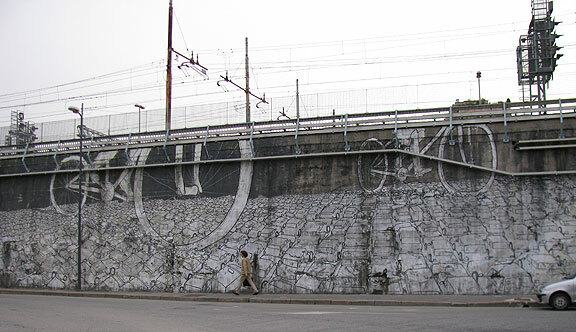 This is another part of the same huge wall by Blue. Yes, it's fun! 4 appearances in 4 nights in Milan... next stop: Lugano!